Get inside information on physician pay in your specialty and region. Are you negotiating a new contract? Or do you want to know what your peers are being paid? This free report analyzes the four leading physician salary surveys to provide a comprehensive look at physician pay in 2015. Charts on such topics as pay by specialty, location and employment model. Analysis of compensation trends by specialty. Examination of how bonuses are awarded and the impact that bonuses have on physician compensation. 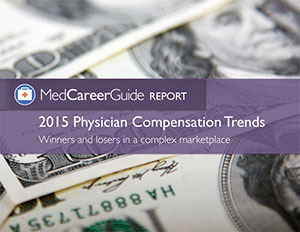 Download the MCG Physician Compensation Report for free. Physician salaries across nine regions in the U.S.
Make sure you are informed when negotiating your next contract.